Viewed from the West, Russia's President, Vladimir Putin, is in the diplomatic dog-house. His annexation of Crimea and military involvement in eastern Ukraine broke the settled pattern of post-Cold War relations in Europe. The Russian military's increasingly aggressive patrolling and exercises on the margins of Nato have raised genuine concerns - even in a country such as Sweden - that a conflict with Russia can no longer be regarded as impossible. Reluctant Nato governments are slowly increasing defence spending, and the US is taking steps to reinforce its forward presence in Europe. Russia, of course, puts the boot on the other foot and blames Nato's expansion for its increased military readiness. But this is a government widely believed to have sent its agents to poison an opponent in London, leaving a radioactive trail across the city. Curiously then, the prevailing Western response to Russia's engagement alongside President Bashar al-Assad's government in Syria has been to argue Russia and the West potentially share some common ground. Russia - at least up to a week or so ago - was seen as a co-sponsor of the diplomatic effort to bring peace to Syria and a vital element in any solution. Whether this view - in hindsight largely wishful thinking - will survive the onslaught by the Syrian Army and its allies on Aleppo remains to be seen. It is Russian air power more than anything that has changed the fortunes of the Syrian government. And this offensive - coming just as a new round of talks was getting under way - effectively poisoned the discussions before they really began. So might this be a moment when the scales will fall from Western eyes and Russia's true intentions become clear? We are not talking here about morality or what is right - there is precious little of that to go round on any side. Syria is an appallingly complex problem, and no single party can be blamed for the continuation of the war. What we are talking about is Realpolitik. And here, Moscow has given Western capitals an object lesson in what can be achieved. To the Western view there is no military solution in Syria, Moscow has effectively begged to differ. It chose a side - a side credible militarily in the sense it had too much to lose if defeated. That side had reasonably effective allies such as the Hezbollah fighters and various militias recruited by Iran and guided by Iranian commanders. And Russia itself deployed sufficient resources to make a difference. It took a little time, but the results on the ground are now clear. Russia set for itself an achievable goal - to bolster the Syrian government and ensure it retained control over a significant part of the country. In so doing, it has unleashed its air force largely against militia fighters backed by Turkey, the Gulf Arabs and the West, and it is winning. Contrast the Western approach, beset by problems and contradictions at every turn. The West backs so-called moderate militias - but who exactly are these moderates? Many are being forced into alliances with groups close to al-Qaeda. Yes, Washington and al-Qaeda are objectively on the same side - contradiction number one. Of course, the West is largely in it to defeat so-called Islamic State (IS). But is this the primary goal of its regional allies such as Saudi Arabia and Turkey? No, their chief goal is to secure their strategic stakes in Syria - ideally by destroying President Assad. IS is their enemy, but in many ways a secondary one - contradiction number two. Then, of course, there is the Kurdish question. The West's most effective allies on the ground are Kurdish fighters. But the Turks see them as a threat and any nascent Kurdish entity as a nightmare to be avoided at all costs - contradiction number three. By contrast Mr Putin's life is simpler. It is often said he has the advantage over his Western peers of not having to worry about public opinion. Thus, the downing of a Russian airliner created little of the waves of protest at government policy that might have happened if a Western plane had been destroyed. But think this through logically. Is anything about Western policy a reflection of public opinion? The publics are as confused as their political masters. How do you react to drowning refugees, terrible suffering, and apparently intractable conflicts in places at one and the same time far away but also so terribly close? Mr Putin is not just achieving his military goals in Syria. His success threatens to reduce the country to two enclaves - a coastal rump dominated by the Syrian government and the rest broadly in the hands of IS. What will the West's choices be then? 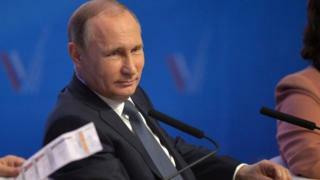 Mr Putin has shown Russia remains a force to be reckoned with in the Middle East, just at a time when the Americans seem best characterised by vacillation. He has shown Russia has a limited but nonetheless impressive expeditionary military capability, and he has given a runout to much of Russia's latest hardware. So, for now, Mr Putin has a victory of sorts. I suppose the question is how long will it last? Russia's own underpinnings are shaky. And with low oil prices set to persist, can the president really afford to behave like a kind of throwback to the Soviet era? But, make no mistake, the Syrian peace process is stillborn. The fighting will continue, with so-called moderate forces squeezed between government forces and IS. The Kurdish question will continue to rear its head. And the refugee flow towards western Europe will continue unabated. In unifying ends and means, Mr Putin knows what he wants. And, for now, he seems to be getting it.